Please take a moment and be a part of history by supporting the preservation of a series of historic rare archival videotape interviews - many never released - from "The Fantasy Film Worlds of George Pal" (1986).....and before they are lost forever! In the annals of Hollywood, Academy Award winner George Pal will always be remembered as a titan, a brilliant visionary who profoundly shaped the art of motion pictures. As an animator, Pal was a pioneer of stop-motion animation known as Puppetoons ™ and a peer of Walt Disney and Walter Lantz. In the 1950's as a producer and director of live-action films, he brought to the screen such classics as "The War of the Worlds", "The Time Machine", "When Worlds Collide", "Destination Moon", "Tom Thumb", "Houdini", "Atlantis the Lost Continent" "The Wonderful World of the Brothers Grimm", "7 Faces of Dr. Lao", "The Power", "Doc Savage: Man of Bronze" and others. Pal's cinematic legacy can be traced in the works of Walt Disney, George Lucas, Steven Spielberg, Gene Roddenberry, Tim Burton, James Cameron, Peter Jackson and dozens of others. The original 1 inch 'B' NTSC video format used in the production of "The Fantasy Film Worlds of George Pal" are long out of use. To make matters worse, only 2 working 'B' NTSC machines exist that can aid in the digitization process. There is no telling how long these machines will last or their working parts as they are also no longer in existence! It goes without saying, this is a severe race against time to preserve what represents the only film document ever made on George Pal and the beloved one of a kind icons that worked with him.... most of whom have sadly passed on. The historical importance of preserving and digitizing these interviews cannot be overstated! Talent interviews to preserve includes: Rod Taylor, Alan Young, Tony Randall, Tony Curtis, Ray Harryhausen, Ray Bradbury, Gene Roddenberry, Charlton Heston, Janet Leigh, Russ Tamblyn, Barbara Eden, Ann Robinson, Roy E. Disney, Ward Kimball, Robert Wise, George Pal, Mrs. George Pal, David Pal, Gae Griffith, Walter Lantz, Gene Warren Sr., Wah Chang, Jim Danforth, Robert Bloch, Chesley Bonestell, Albert Nozaki, William Tuttle, Duke Goldstone, Bob Baker and Phil Kellison. The digitizations will be used to upgrade existing productions. Eventually they will be find a home with film footage companies and possibly donated to an educational institution yet to be determined. Your generous donations will help save these important interviews from deterioration and will be most gratefully appreciated by me and future generations to come! Thanks again for taking a few minutes of your valuable time to consider being a part of this historic effort. Arnold Leibovit is an award-winning writer, director and producer. He wrote, directed and produced the acclaimed film tribute "The Fantasy Film Worlds of George Pal" (1986) profiling the life of the Oscar winning science fiction and fantasy film pioneer, who directed the first screen telling of H.G. Wells' "The Time Machine”. "Fantasy Worlds" features a who's who of over 25 stars and industry greats that worked with the late director. The film premiered at the Academy of Motion Pictures Arts & Sciences and has since aired on The Disney Channel, PBS and won numerous awards. The DVD was released by Image Entertainment (September 2000). Following this film, Leibovit obtained the rights to "The Time Machine" book and the motion picture which led to his Executive Producing the (2002) Dreamworks/Warner Bros. remake starring Guy Pearce and Jeremy Irons with special effects by Digital Domain, Industrial Light and Magic and Stan Winston. Leibovit is currently Executive Producing a re-imagining of "The Time Machine” with “It” director Andres Muschietti and Leonardo DiCaprio as well a re-boot of George Pal's Oscar winner "7 Faces of Dr. Lao”. 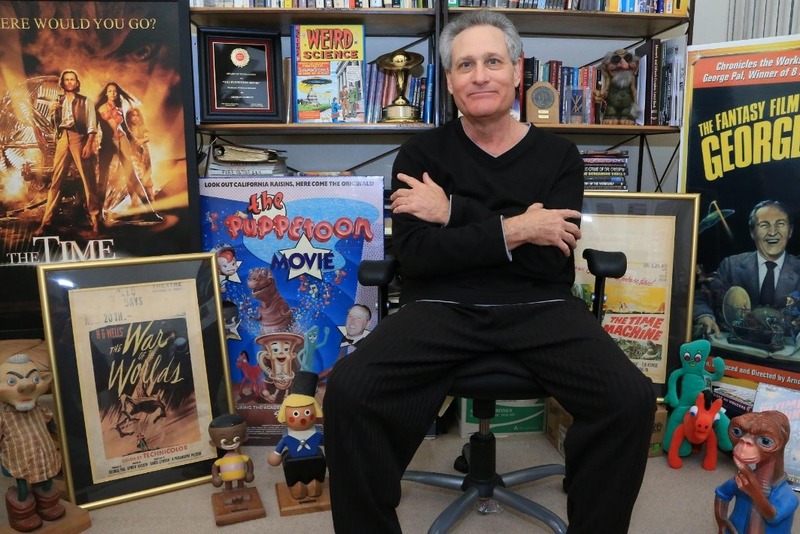 In addition, Leibovit directed and produced "The Puppetoon Movie" featuring such classic animation characters as Gumby, Pokey and Tubby the Tuba and the Oscar winning animated films of George Pal. The film premiered at the first American Film Institute Film Festival, distributed theatrically by Expanded Entertainment and has since screened at international film festivals in such cities as London, England; Annecy, France; Sitges, Spain; Tokyo, Japan; and Melbourne, Australia, as well as airing on Showtime. The DVD was released by Image Entertainment (November 2000) and a newly restored expanded Blu-Ray was released by B2MP Inc. (December 2014) that includes more newly restored Puppetoons with the cooperation of Paramount Pictures, The Academy of Motion Pictures Arts and Sciences and UCLA. Leibovit also produced the DVD re-release of "The Great Rupert" (2000), George Pal's first feature film, by Image Entertainment and the Blu-ray version (2014) released by B2MP Inc. on "The Puppetoon Movie" disc set. Leibovit served as associate director/editor of King World Productions "Rascal Dazzle" featuring Hal Roach's "Our Gang" comedies, which was narrated by Jerry Lewis and scored by Nelson Riddle; and directed three award winning short subjects: "Penny Lane" (1975) renowned film on toy mechanical banks, "Judgment: An Essay on War" (1974) widely televised and "The Fatherland" (1973) selected by The Whitney Museum of Art as part of The New American Filmmakers Series. Apart from the big screen, Leibovit produced the CD soundtrack re-scoring of the 1960 "The Time Machine" (1988) with its original composer Russell Garcia and the "The Fantasy Film Music of George Pal" (2004) CD covering the MGM/Warner Bros. years (1958-1975). Mr. Leibovit served as Production Executive for Mavin Productions and the original Broadway Chicago musical comedy "Do Black Patent Leather Shoes Really Reflect Up?". Next to "Grease" this was the longest running show in Chicago history. Leibovit also directed Neil Simon's "Star Spangled Girl" at the Neil Simon Comedy Festival in Cedar City, Utah (2005). Mr. Leibovit received the George Pal Memorial Award 'The Saturn' from the Academy of Science Fiction and Fantasy three CINE Golden Eagles, two International Film & TV Festival Awards, two Awards of Excellence by the Film Advisory Board and many others. Leibovit is an acting member of the Producers Guild of America.